Many years ago the roseate or greater flamingo (Phoenicopterus ruber) could be found throughout the salt ponds of Anegada. The Anegada flock was known to inhabit the ponds in large numbers, possibly by the tens of thousands! One of the ponds here even bears the name of the bird – Flamingo Pond. 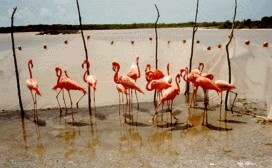 Flamingos were also regarded as a food source and historically hunted by peoples living on the Puerto Rico Bank. By the 1960’s, when large-scale development of Anegada was initiated, there were but a few older birds remaining. The remnants did not function as a breeding colony and eventually died or flew off. Dr. James (Skip) Lazell, president of The Conservation Agency, first recognized the potential for successful reintroduction of flamingos to the salt ponds of Anegada in the early 1980’s. Cooperating organizations and individuals, including the Bermuda Aquarium Museum and Zoo (BAMZ); Richard Winchell, Mocata Corporation; Dr. Henry Jarecki, the BVI National Parks Trust (NPT) Director; Nick Clark; and others moved a small test group from Bermuda to the small salt pond on Guana Island. Guana is a neighboring island in the British Virgin Islands (BVI) where this small group would enjoy the protection of the Guana Island Wildlife Sanctuary. This group of eight suffered some natural attrition during hurricanes and other natural events, but demonstrated that a larger group, taken from Bermuda where they are bred and brought to a salt pond within their historic range, might succeed. The last three birds eventually flew away and were frequently sighted around the BVI. In 1992, TCA, this time led by Dr. Numi Mitchell, James Conyers (BAMZ), and the Guana Island Wildlife Sanctuary, organized the transportation and release of 22 flamingos on Anegada and eight on Guana. The number to be released on Anegada was the largest number of greater flamingos available to TCA and was thought to be above the minimum number necessary to reproduce. The always-generous Lowell and Sue Wheatley at the Anegada Reef Hotel hosted the group and supported the effort on Anegada. The birds were wrapped in cheesecloth and had a long ride by private jet from Bermuda to Tortola/Beef Island airport. They were taken through customs and proceeded by boat to Anegada. TCA researchers Dr. Numi Mitchell and Glenn Mitchell; James Conyers, BAMZ staff member; and TCA field assistant Rondell Smith from Anegada, unwrapped the birds and released them into a seine net enclosure for release the next day. They wobbled on sleepy legs, tasted and drank deeply of Anegada salt pond water, and took in glimpses of freedom through the seine net for the first time. We camped at the site of release and let the birds quietly strain the water, honk a bit, and mill around the enclosure as they adjusted to their new surroundings. The next morning the net was opened after a brief ceremony and the birds balked, tiptoed, and then ran to the middle of Manhead Pond. Several individuals had been pinioned in order to anchor the flock on Anegada until they were established as a breeding colony. There certainly are not many people on earth that would deny the natural beauty of these birds and feel, as they watched them go, that something important had happened that morning. Also evident was the realization that Anegada had been missing this important part of its fauna for far too long. If it were a snake release to increase biodiversity, the point would be less poignant. Many watched the flock throughout the next several years as they moved around the connected salt ponds. Rondell Smith, the BVI NPT representative on Anegada, collected data and kept an eye on courtship displays and building of nesting mounds. Unfortunately for these pink birds, the tourists who often resemble the local red and peeling gumbo limbo trees (‘log’ in the BVI, Bursera simaruba), were also keeping an eye on the flock. They would frequently muck right into the salt ponds for a picture of what had rapidly become wild birds. Nesting mounds were often trampled and abandoned. Unfortunately there is no national park on Anegada and no way to prevent harassment. After several years a subset of flamingos moved to other ponds on the island that were not accessible by road. As Rondell tells the story, he heard the honking, looked up, and saw a handful of fledglings, guided by older birds, coming to join the rest of the flock in the bigger ponds. The flock today numbers hundreds of birds and is a striking spectacle to witness.